Der Wachtelschlag, WoO129, belongs to the antique tradition of bird calls in music, in this instance, a bird whose calls invoke God ('Fear God … Love God … Praise God … Trust in God … Implore God', it sings). The words were written in 1796 by Samuel Friedrich Sauter (1766-1846), a village schoolmaster whose unpretentious poems were attributed to one 'Gottlieb Biedermeier'—a sarcastic appellation—'by Ludwig Eichrodt and Adolf Kußmaul in Munich’s Fliegende Blätter, thus giving rise to the stylistic term 'Biedermeier' for the period between revolutions in the German-speaking world (1815-1848). Sauter based his paraphrase, first published in 1798 in Carl Lang’s Taschenbuch für häusliche und gesellschaftliche Freuden, on a folk song widely known in the eighteenth century (Goethe knew it). It is a fascinating exercise to compare Beethoven’s setting with Schubert’s better-known setting, first printed in 1822, then revised as Op 68 in 1827: both men inevitably devised the same dotted rhythmic figure for the quail’s calls, 'Fürchte Gott! Liebe Gott! Danke Gott! Lobe Gott! ', but almost everything else is different. Schubert’s artful Lied im Volkston is the voice of Nature, of the merry quail, while Beethoven takes the poem far more seriously and from the perspective of the human being who listens to these worshipful injunctions. 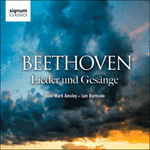 Ranging farther afield tonally than his younger contemporary, Beethoven’s storms are more tempestuous (the low bass rumble of thunder is a particularly wonderful detail), his acclamations of God’s praise grander, and his pleas for God’s aid more plangent. Der dich zu loben vermag. It is the quail, his voice so clear. So good and gentle; do, please take heed. Prompting you to give due praise. Take them to heart, men of the weald. Do nature’s storms cause you to fear? He will protect you; he is near. Are you afraid of the dangers of war? He will save you for evermore.